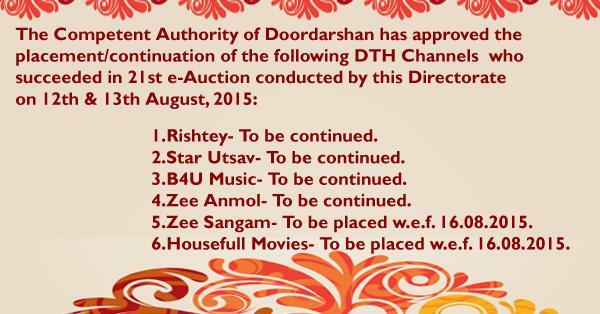 DD Freedish announced for 22th e-Auction for vacant slots on DD Freedish Platform on 22 September 2015. This is very good news for DD Freedish viewers that 5 channels renewed its licence to stay on DD Freedish platform and 1 new channel going to be add, channel name is "Zee Sangam". Zee Sangam is Infotaiment or Regional News channel for UP and Uttarakhand. This information shared by Mr. CK Jain on twitter. According to Mr. CK Jain, Rishtey TV, Star Utsav, Zee Anmol, Zee Sangam, Housefull Movies and B4u Music won DTH Slot. Where Zee Sangam Channel is new addition on this DTH. for more updates of DD Freedish, Keep visit this unofficial blog on DD Freedish DTH. how many years or decades you want for filling vacant slots?